Considered as the outdoor room, homeowners are on the hunt for backyards that offer more than just a lawn or a garden. Nowadays, a backyard is more than that; it’s a venue to host parties, a beacon for family gatherings and a sanctuary from inside the house. Below are 5 outdoor trends homeowners love in 2018 with a downloadable infographic to share on Facebook. Social homeowners are looking to get the most out of the backyards by converting them into outdoor rooms. They’re optimizing their outdoor living space, so they can host parties for friends and family. The most popular types of outdoor furniture to keep their guests comfortable are lounge chairs, dining furniture and benches. Part of optimizing includes combating bad weather. Homeowners are purchasing fire pits, heaters, misters and ceiling fans to keep their guests warm during cold nights and cool during hot summer days. Enhancing the ambiance of a backyard with patio lights is in demand among homeowners. Draping lights from wall to wall can provide a dream like atmosphere for guests. Want to take it a step further? Hooking outdoor lights to a dimmer switch can turn a backyard into a cozy, romantic getaway with a serene atmosphere. The last elements homeowners purchase for their backyard are entertainment products such as televisions and outdoor speakers. Picture John watching the game while BBQing or Lauren singing along to a song while gardening. If optimizing outdoor living space is on your client’s list of priorities, then outdoor entertainment is a must. 2. Let the Sun Shine, Let the Sunshine in! These days, homeowners desire more natural sunlight in their homes. More or larger windows, glass doors and skylights are not only the best ways to optimize natural light, but they also help connect the inside of a home to the outside. Can Matt wash dishes while the kids run around in the backyard? Can grandma cool off a pie in the window sill? Will Mike and Mindy save money by opening windows and French doors to stay cool during hot summer days or use an A/C unit? Are you tired of seeing the same old trees and bushes? Homeowners are too. With so many options available, the trend is planting new types of foliage! Instead of the tradition yew or rhododendrons, try sugar maple, myrtle, or cedar trees! Personalizing landscape by choosing the right plant and placement will create a unique backyard experience, be strategic. Remember, don’t plant trees too close to your house because it can ruin the foundation and try to pick trees that don’t shed leaves too often. If your client doesn’t have any plants, gift them a house warming present as an opportunity to get them started! Canopies and pergolas are the most popular ways to provide shade and protect outdoor furniture. There are some differences between them: canopies tend to be priced lower, be more mobile, and offer more shade than pergolas; pergolas, on the other hand, tend to look nicer and be more durable. When outdoor space is minimal, it’s best to grow up! Vertical gardens maximize space for plant lovers, giving them the freedom to grow their own herbs, vegetables and other plants. Not enough wall space? Checkout a standalone vertical garden! Not enough floor space? A hanging vertical garden might be better for you. What Should I Do with This Information??? Share this information with your real estate prospects! Offer great customer service by offering free valuable tips on how they can do little things to increase the value of their homes. Whether your clients are landscaping, creating an outdoor room, or increasing nature light indoors, optimizing outside the home is THE trend. If they plan on hosting parties or inviting family over for holiday dinner, it is time to optimize their yard. Download and share the Outdoor Trends Homeowners Love Infographic with your network to show them the benefits of outdoor renovations and home ownership! 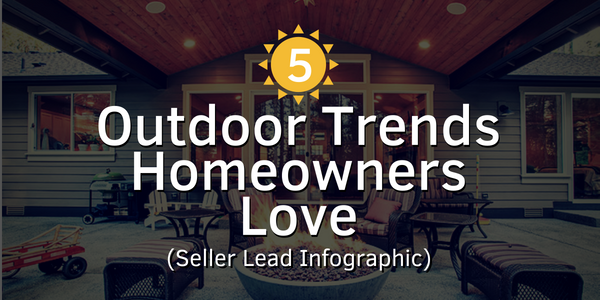 Download, share, and engage your social network with the Outdoor Trends Homeowners Love Inforgraphic today!